One of the key practices in the traditional schools of non-duality is to reflect deeply on statements from an enlightened source indicating the identity of our self with the universal Self. This is to be done alongside preparing the mind by practicing inner and outer self-control. 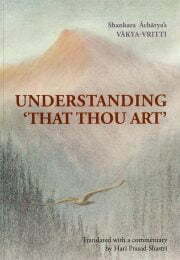 Understanding That Thou Art provides both texts for reflection of this kind, and guidance on how to do so. There are four statements indicating higher truth widely known as the Mahavakyas or ‘great sentences’. One of these is Tat Twam Asi or ‘That Thou Art’. The right way to understand this statement is discussed in detail by Shri Shankara, as the culmination of his teachings. Reflecting on such a statement in the right way, when the mind has been prepared by the necessary disciplines, is the way to inner illumination, according to Shri Shankara and the traditional teachers of non-duality. Understanding That Thou Art contains a translation of a text called in Sanskrit Vakya Vritti, which is one of the places where the meaning of ‘That Thou Art’ is discussed by Shri Shankara, or perhaps by a close follower. Also included here is a commentary on the text by the translator, Hari Prasad Shastri, to clarify the teachings for modern readers. In this text Shri Shankara, or his follower, first shows, by rigorous reasoning, what the statement does not mean, and then eludicates what it is indicating positively. Since Shri Shankara’s time this has been accepted as the right way to approach the true meaning of the highest teachings. Commentary: This is another convincing argument. Let Hume and Locke reason as they like, it is none the less clear that the element in human personality which reveals the body and the mind is neither of them; the revealer is not the revealed. Similarly the Self, which reveals the mind and the body, is not the mind and the body but is different from them. Its nature too, being imperishable and infinite and immutable, is different from the nature of the body and the mind which changes at every moment. The Buddhist theory that consciousness is a series of moments of change is contradicted in this verse. These verses are to be meditated upon in perfect silence, physical and mental, and then they will give rise to true Self-consciousness. Intellectual conviction gives no more than a clue to this state. This verse is a commentary on the famous dictum ‘That Thou Art’, which is the foundation of Vedanta. The word ‘Thou’ does not here mean the mind, but the immutable consciousness which is beyond change. That which changes is perishable because it exists and functions in time and space. The changeless entity is the infinite, imperishable Self which is the witness of all the changes of the mind and the body, and the word ‘Thou’ in the great sentence (mahavakya) under consideration refers to that consciousness. Understanding That Thou Art would provide academic students with an idea of the non-dual philosophy and methods. For sincere seekers who are doing meditation and related practices regularly, it would be a valuable book for dedicated study time.